Throughout the year we have working parties to tidy up and maintain the churchyard. Keep an eye on the Weekly News sheet for dates. You are welcome to join us. In 2014, our Vicar Tom met with Emily Stallworthy from Devon Wildlife Trust to talk about enhancing our churchyard as a home for wildlife and to create a space for people to interact with their natural surroundings. Emily wrote a report of recommendations (pdf) for the different areas of the churchyard, and some excellent suggestions for planting, wildlife homes, and activities. List of the recorded Memorials (pdf) contained within St David’s churchyard. 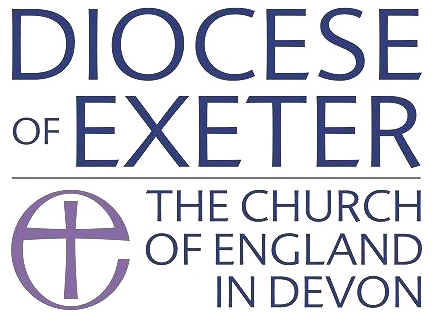 Should you have any specific questions please contact our Archivist, Mrs Iris Sutton at research@stdavidschurchexeter.org.uk. Alexander Cavalie Mercer was arguably the most famous officer who fought at Waterloo on 18th June 1815. He is buried in the churchyard. There is currently a project to restore Mercer’s grave, which had deteriorated over the years. 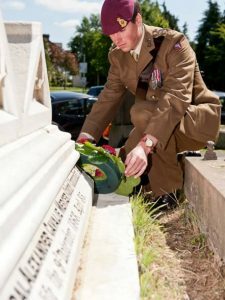 On Thursday 18th June 2015, 200 years to the day since the Battle of Waterloo, a wreath laying ceremony took place at the graveside of General Mercer in our churchyard at St. David’s. Tom held a short service of remembrance for Alexander Cavalie Mercer who, then a 2nd. Captain, was arguably the most famous officer who fought at Waterloo on 18th June 1815. The sun shone on a warm morning as people gathered around the newly renovated grave of the General. Among those attending were twelve soldiers of the 7 Parachute Regiment of the Royal Horse Artillery G Battery (7 Para RHA) known as Mercer’s troops, who had travelled from Colchester where their Regiment is based. Here their Captain solemnly lays a wreath at Mercer’s grave. About 20 civilians also were present paying their respects and remembering with pride one of the most famous battles in British history. General Mercer died in 1868, aged 85, and shares his grave with his sister, Theodosia McNeill, who died in 1881, aged 97. Mercer established a home in Exeter at Cowley Cottage, Cowley Hill, while his sister lived nearby in the Parish of Elmgrove. After the ceremony, it was a privilege and a pleasure to provide coffee and biscuits, for those who wished, at the West End of the Church. Please see the leaflet at the back of the church which will give you more details about General Mercer.